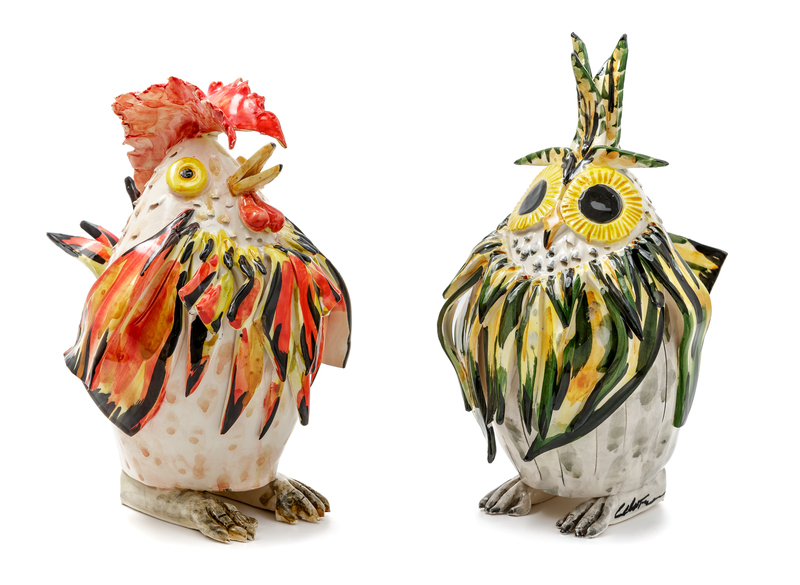 The local fauna originally inspired the production of these joyful and expressive owls and cockerels, crafted with wise and original artistic taste and technical ability. The sinuous red and black female figure of the precious jewel su kokku is an expression of the rich traditional costume used for special-occasions. Being entirely hand-shaped, it comes in different forms and sizes, making each creation unique. 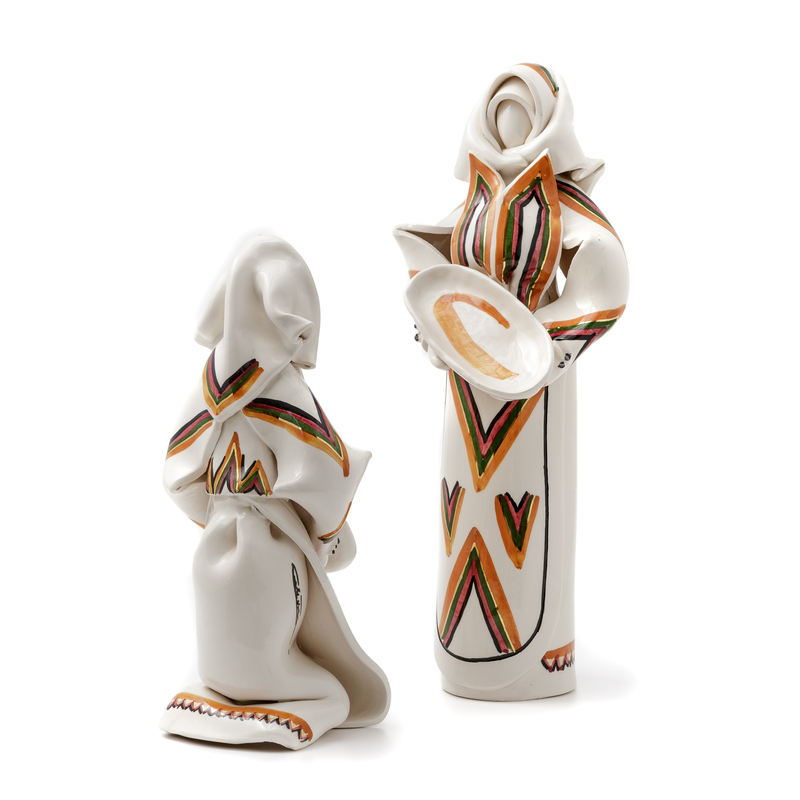 The stylised female figure wears the captivating traditional costume of Orgosolo, a landlocked village in central Sardinia, which is evoked by means of skillfully applied coloured brush strokes on a white background. Celestina Spiga’s Celesteceramiche works evoke an ancient history transposed into contemporary times. 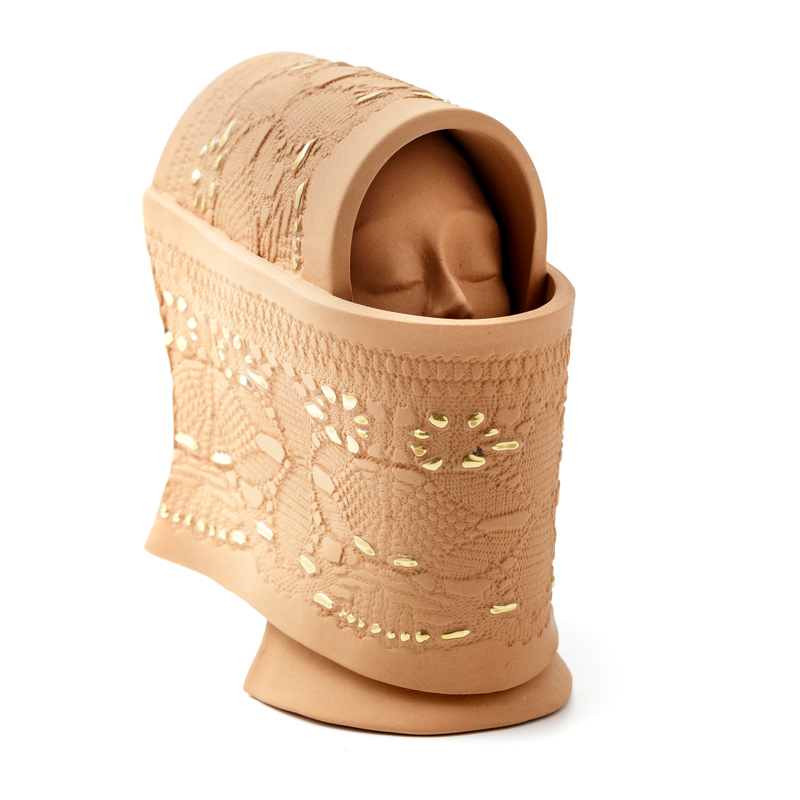 A sensitive craftswoman who was only 16 when she approached the art of ceramics in a ceramist’s workshop - pupil of the well-known Master ceramist Stelio Mola, whose artefacts were renowned for the line of figurative Sardinian-inspired ceramics – she proved to have a particular manual ability and a clear artistic flair. In 1991 she set up her own business in Elmas, a small town on the outskirts of Cagliari, where she started an impressive production of figures wearing the traditional costume, testifying their style and colours in detail and thus recalling a wide range of local beauty. In particular, over time she has elaborated the female figure achieving solutions that synthesise the sinuous folds of the cloth using little colour, which reveal a much more complex story dating back to ancient traditions. Celesteceramiche productions can be found at the Elmas workshop and in many retail shops in the major tourist centres of the island that specialise in quality artefacts. Several lines of sculptures and artistic decorative objects are created in Celestina Spiga’s workshop. Worthy of note is the series of female figures wearing the traditional costume, produced with many variations synthesising elements of local tradition, in addition to a prized series of women’s faces finely framed in draped headgear. 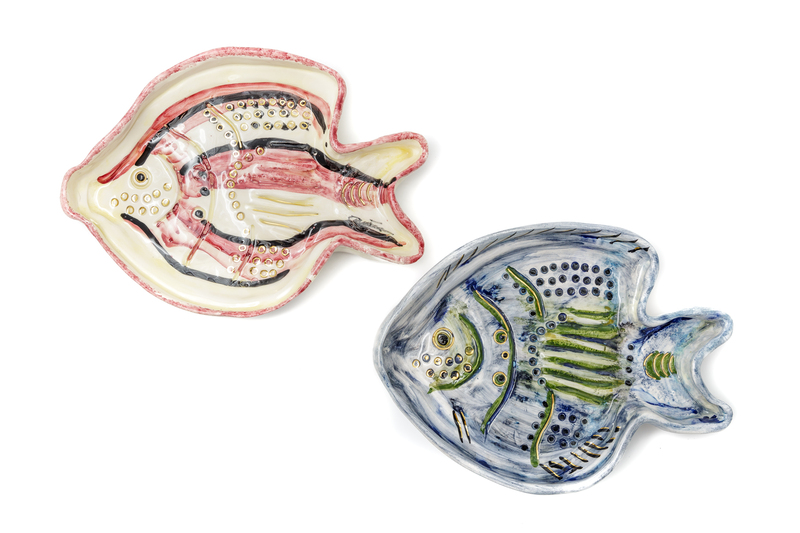 The line of animal sculptures, with lively shapes and coloured brush strokes, reproduces specimens of the local fauna using an expressive personal style, also present in her glazed ceramic fish-shaped dishes. These ceramic products are all handmade. 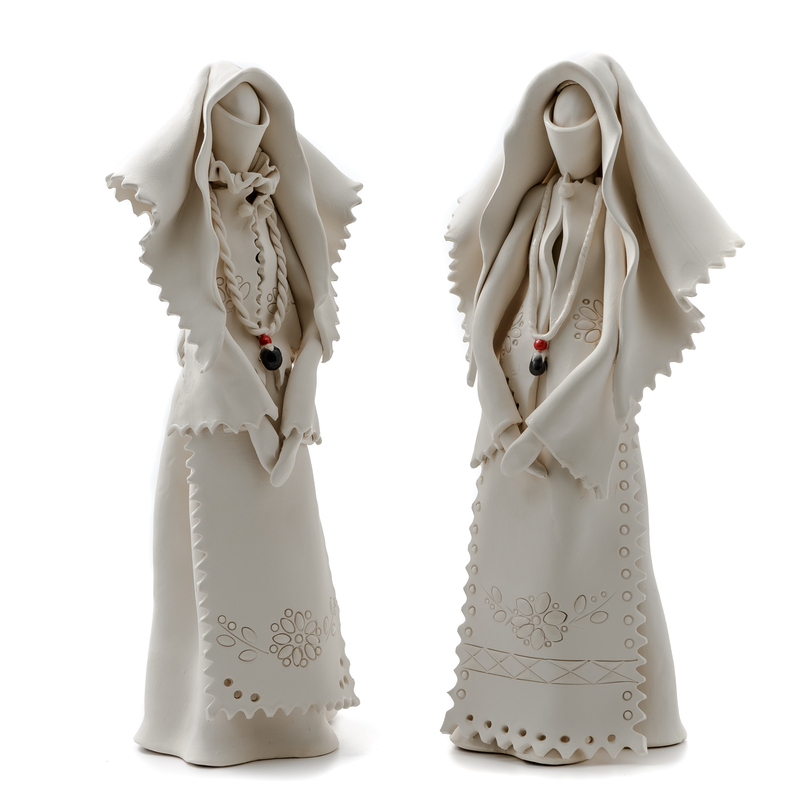 She crafts the sheet of clay and moulds it, engraves or imprints it with marks or motifs. The polychrome effect is obtained by applying coloured crystals with a brush, before firing the artifact. Pure gold details are added with third firing.